The majority of people in India depend on public sector banks for their banking needs. This is nothing surprising as the public sector banks run amazing offers, they charge fewer interest rates than the private banks, and also provide good service. The popularity of India's govt sector banks is quite clear from the fact that top spots in the 'list of best banks in the country' are proudly acquired by them. The reason why people in India are glued to the country's public banks is the low-interest rates. These banks do not charge any hidden costs, unlike private banks. Also, opening any type of account whether it's saving, current, in these banks, is quite easy. There was a time the service provided by the employees of public sector banks was defamed by every person. That time has become history now. Due to tough competition in the banking sector, an improvement in the service of public banks has been observed. Also, People prefer govt banks for loans. 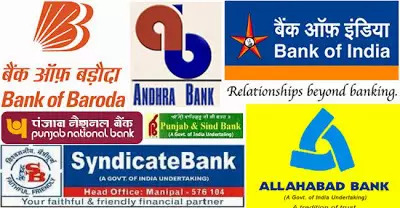 If you are looking for a public bank for your banking needs, then this list of government banks in India is meant for you. This list will make you aware of the public sector banks in our country. You can then opt for any after doing a bit of research. i am hard working candidate in any organization please give me any job.